Manchester United players have been posting on social media to bid farewell to former teammate Marouane Fellaini. After the Belgium international’s transfer to Chinese Super League club Shandong Luneng Taishan, his former teammates said goodbye on Twitter. 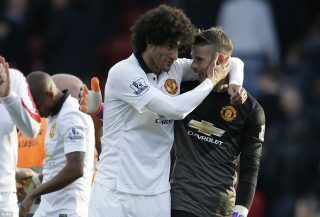 David de Gea was one of the first to wish Fellaini well on the next chapter of his journey as a footballer. At United, he won the FA Cup, League Cup and Europa League. I’m sure it’s always difficult losing a member of the dressing room, particularly someone liked by fellow teammates, and it looks like Fellaini was quite popular. See the rest of the tweets from United players wishing Fellaini the best below. We’re sure there will be more messages for Fellaini throughout the weekend.